2010 Topps WWE Platinum was one of the standout wrestling card sets last year, largely because of the use of all-foil base cards. This was something that hadn't been done for a major wrestling set since Comic Images did it back in the late 1990s when WWE was in the middle of its "Attitude Era." The shiny look is back again, this time with 2011 Topps WWE Classic. Although the cards carry a regal look, it's curious name considering it's not a WWE Legends-focused set but rather the usual mix of current superstars, Divas and a handful of names from the past. The autograph and relic card offerings look to be expansive, with the early checklist showing 16 slots for each (although no names have been confirmed). A planned insert set focused on the Rock and John Cena was cancelled. 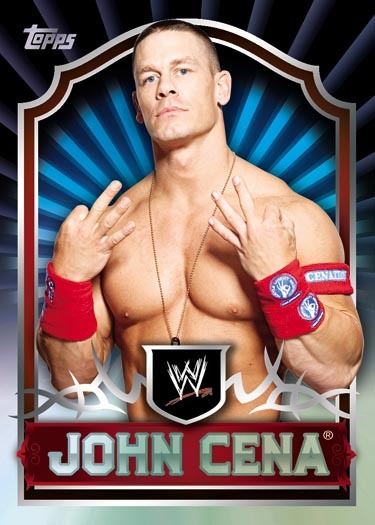 See some of the top cards in the set with our 2011 Topps WWE Classic hit tracker. 90-card base set featuring current stars, Divas and WWE Legends. All cards are printed with foil technology. Autographs card gallery and checklist. Event-worn Relic Cards (16 cards). 2011 TOPPS WWE CLASSIC WRESTLING HOBBY BOX!! AMAZING DEAL! !